Our Legacy Knives are the knives in which we incorporate customer-supplied materials: a grandfather's old files; an apron baked in for years; a medal earned for heroism in an long-past war; a shirt worn for a proposal; lace from a wedding dress; golf balls to mark the past-time of a father and son; wood from a rolling pin used by a grandmother, then a mother, and now a daughter. These objects mark the deep, long remembered moments of people's lives, and now they are stored in knives that can be passed down for generations. We are honored to be able to offer such a service. Here are some of the gifts of which we have been able to be a part. 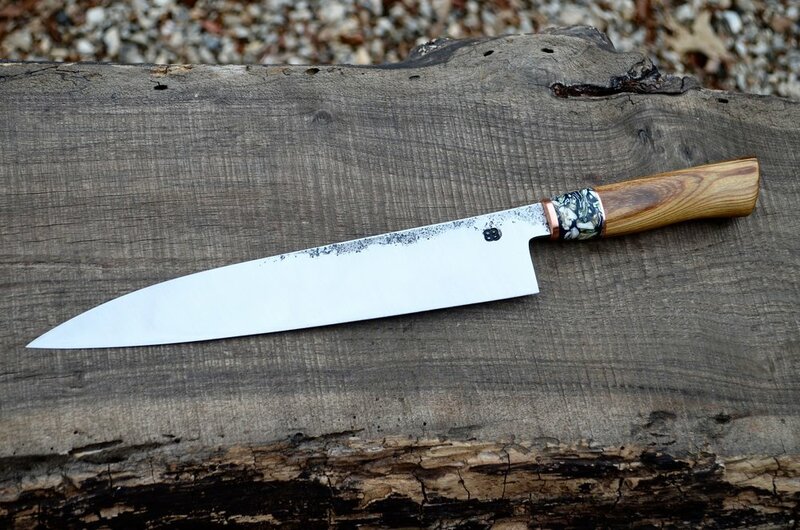 This knife was commissioned from a wife to her husband to commemorate his upbringing in Louisiana, the cypress trees he grew up around, oyster shells in memory of his father, and an apron to symbolize his love of cooking. Cypress, oyster, and apron are all laminated together in the spacer of the knife. A family commissioned us to make a series of knives with objects from their family farm in Mississippi--arrow shafts, shell casings, antlers, and the leaf springs from a 1942 Jeep Willys. The wood handles are from a Pecan and a Honey Locust that is also standing on the property. Though the family is spread out all over the country at this point, the various knives serve as reminders of that place. Leftover lace from a hatband forms the ferrule on this chef. We added blackwood and copper to complete the handle. (Knife photo by Paige French). We made this set of knives from two metal files, a railroad spike, a pair of Nomex firefighter pants, and a pair of BDUs. The materials represent four generations of the customer's family. The slicer is from a rattail file, the petties are from a large flat file, and the carving fork is from the railroad spike. For the handles, we employed the fabrics both singly and in congress with each other. We combined coffeebag with the patches from a husband and wife who have done six tours in the Middle East between them. The blades are made from two sawblades: the Chef is from a family-owned lumber mill in Sewanee, GA, and the other is from a sawmill in Abbeville, SC, which opened in the early 1900s and closed in the 1960s - the blade was all that remained from that family's mill. This customer sent us a collection of golf balls and pennies that he collected on walks with his father when he was a kid. It took us more time than was strictly necessary - and several near-miss hammer rebounds - to figure out that trying to break golf balls rather than cutting them wasn't going to work. We combined a dress shirt with some Brazilian coffeebag to get the ghosting in the handle and used the shirt by itself for the spacer. Little details like using the head of the penny at the ramps and the tail-side as an end cap were particularly gratifying in this project. Sawblades from Ackworth, GA, make up the blades on the gyuto and taper, and we used chevy coil springs from here in Athens on the fillet and petty. We laminated scraps from this customer's childhood quilt into a handle with an African Blackwood ferrule and a scrap piece of brass. This set of blades is made of steel from some of the suspension on a 60s Volkswagen Beetle and a sawblade from Elberton, GA. The handles are the combination of Brazilian coffeebag and the shirt and tie from the customer's father. These handles are three aprons from the 1950s laminated together - one red, one blue, and one tan. Each apron's distinct patterns are evident in the layering patterns on the handles.